GETTING YOUR OWN BACK (Paul Brignall): A clever all backs routine with a surprise finish. JUMPING JOKERS (Al Smith): A Joker Assembly with a backfire ending. INTO THE THIRD DIMENSION (Stephen Tucker): A sponge ball is split into two halves. The halves jump from one hand to another and finally fuse back into one complete ball. UNBEATABLE (David Britland): A card is selected, say the Two of Hearts, and lost in the deck. Two Jokers are removed from the deck and placed aside. The deck is spread and the spectator FREELY selects any card, which is then placed between the Jokers. The card turns out to be the Two of Hearts! The deck is turned face up and spread across the table. It consists of all Jokers. CONTAGION (Al Smith): A killer "test conditions" card transposition. MAGIC BY (David Hambly): A snappy small packet routine. DEATHTRAP (Roger Curzon): An extremely commercial Open Prediction effect. YIPPEE! 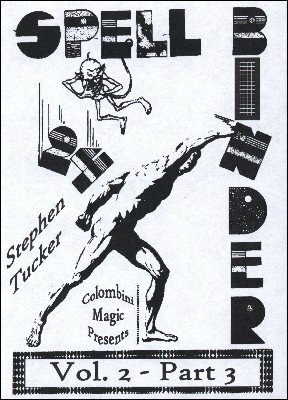 (Stephen Tucker): The magician attempts to push a coin through a table. But it only goes half way through! He then makes it go all the way through and the coin may be fully examined. HOPSCOTCH (Max Maven): The Ace through Five of Clubs are placed in a face down row, in order, on the table. The magician keeps swapping the order of the cards but they always jump back to their original positions.